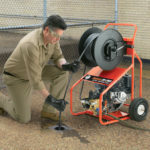 The Mini-Rooter XP gives you extra performance and value, enabling you to clear clogged drain lines from 1-1/4″ to 4″ in diameter with just one machine. 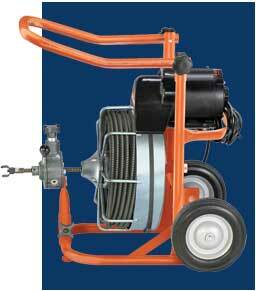 The variable speed Power Cable Feed makes a lot of tough jobs go much easier. 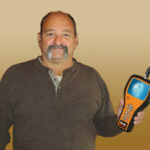 It feeds or retrieves the cable at up to 16 feet per minute. 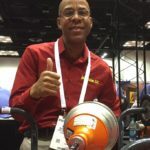 The cage easily holds 75 ft of 3/8″ cable and 50 ft. of 1/2″ cable and features a free floating inner drum with an integral distributor tube to help prevent cable tangling. 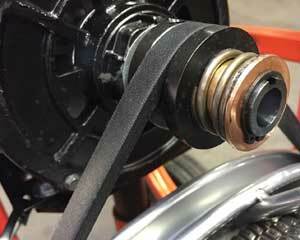 By switching to the optional J-Drum you can handle smaller drain lines. The drum is a snap to remove, taking less than a minute. Clears 1-1/4″ to 3″ lines and most 4″ lines up to 75 ft.
Power Cable Feed drives and retrieves cable. 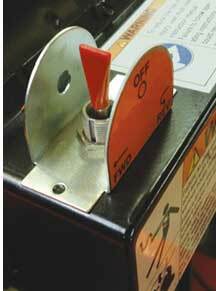 Guide Tube reduces cable drag and keeps hands of off rotating cable. Rolls on 8″ wheels; handle folds for compact storage. Cage removes in seconds for more portability. A variable speed power cable feed attachment makes feeding and retrieving the cable much easier. It quickly adjusts between 3/8″ and 1/2″ cables without the need for tools or additional parts. You’ll want to equip your XP with a power cable feed too. It makes a lot of tough jobs go much easier. The handle is tall enough to make it easy to move the machine to the job, yet it can be quickly folded to take up less room in the vehicle. 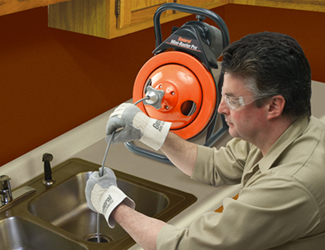 With a J-Drum, you’re ready for small drain work in seconds. Equipped with a collet chuck with tightening handle. Will hold any Super-Vee cable. 24″ deep x 18″ wide x 38″ high with handle folded down (61 cm x 46 cm x 96 cm). Quickly removable from frame. Available in open or closed design. High impact plastic, secured with knob.